This was a fundraising event for the North Georgia School of Gospel Music, a two-week summer camp that teaches theory, sight reading, harmony, ear training, shape notes, composition, piano, voice, conducting, and song writing. Several of the artists participating in the program have either been students or serve in a faculty or other position at the school. The roster of artists included Alan Kendall (formerly of the Melody Boys and the Rebels quartets and chief organizer of the event) Justin Terry (formerly of Cross4Crowns and The Rebels), Redemption Song, Children of the Promise, pianist Jack Clark, Roni Goss, Summer Rahn, and The Mylon Hayes Family. Here’s a short description and some videos from the program. Justin Terry opened up the concert for us. Justin is singing as a solo artist these days. I love Justin’s style and he sang three songs for us from his CD entitled “Countryfied” – I Can See My Home, Long Black Train (always an audience favorite! ), and Do You Wanna Go To Heaven. Redemption Song was up next. The members of this ensemble mostly come from a single church – Free Chapel in Gainesville, GA. I had heard them once before and was delighted to get to hear them again. 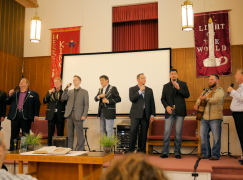 They sang Heartbreak Ridge and New Hope Road, Hide Thou Me, Somebody Sing, and I Rest My Case at the Cross. Alan Kendall was next. 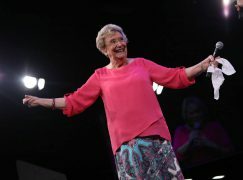 This event is held in his home church – McConnell Memorial Baptist Church – and a lot of the home folks were there to support him. Alan sang You’re Not Alone and Midnight Cry. 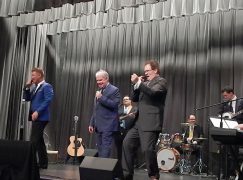 As we had been warned, there was a special, supposedly one-time appearance of a brand new group named “The Four Hoarsemen of the Apocalypse” – consisting of Alan, co-emcee and North Georgia School alumni Chris Adams, Mike Young, who sang with the Rebels and is a member of Resurrection Song, and Justin Terry. They sang He Touched Me. I really, really hope the world gets to hear this group again! Children of the Promise then took the stage. 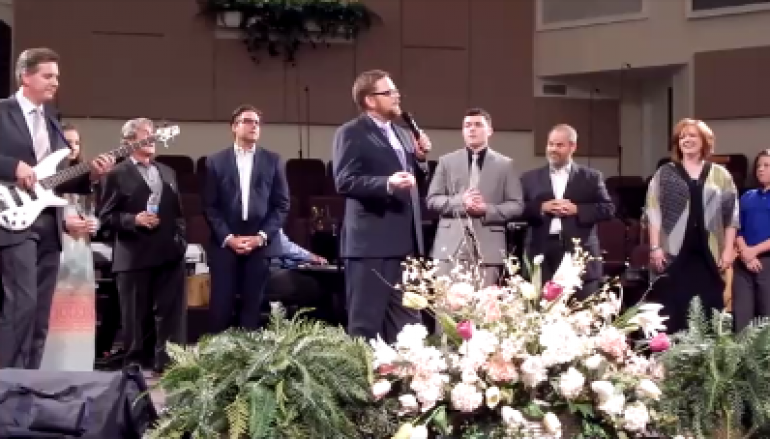 Some of you may have seen the video of Eli Shaw singing I Know a Man Who Can with Greater Vision at the Singing in the Sun recently. Well, this is the family group that he is part of! 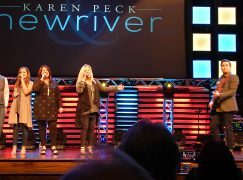 They are from northwest Georgia and I was thrilled that they were featured at this event. Mom Nikki Shaw, and her sons Jacob and Eli performed several songs for us and were an instant hit with this audience, most of whom had not seen them before. They sang The Lifeboat, I Got a Hold of God This Morning, Jesus Loves Me, I Know a Man Who Can, and We Shall Wear a Robe and Crown. Jack Clark was up next. Jack is on the staff of the North Georgia School and has a long background playing with various southern gospel groups – The Harvesters, Homeland Harmony, Landmark, and Songfellows Quartets. He sang/played a funny song about clean underwear supposedly for Mother’s Day (which was the next day). Then he played Goodbye, World, Goodbye, his favorite hymn – Great Is Thy Faithfulness, and Sing Your Blues Away. Roni Goss was next. He sang Cornerstone with Redemption Song. The Mylon Hayes Family was the final group to take the stage – and, boy, were they worth the wait! They sang Steppin’ in the Light, Oh What a Morning, What a Day That Will Be, Rock of Ages Keep My Soul (shape notes on one of the verses, of course!! ), and Love Medley. These kids have been singing since they were small. I came across a video from a Hayes Family concert about 5 years ago that featured the Hayes kids singing In the Same Wonderful Way, if you want to watch just one more! All of the groups joined to sing a couple more songs with the audience to finish out the evening. Alan hopes to have another concert next year to benefit the school and I will definitely plan to be there! Yes, I did! Thanks, Dean.